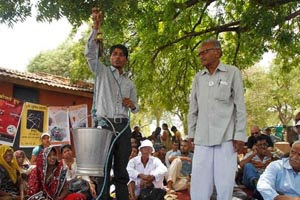 India's rural innovators have proved that ordinary people are indeed capable of extraordinary inventions. Despite many constraints - lack of education and severe cash crunch - most of them have succeeded in using technology cost-effectively to build ingenious products. Few Incredible and amazing innovations mentioned here are incremental improvements to equipment that is most common in rural areas. We really appreciate to those who involved in these inventions which are beneficial to India and other developing countries. Professor Anil Gupta shows Hollywood film director James Cameron a biomass gasifier invented by Raj Singh Dahiya. Dahiya was born into humble circumstances, but taught himself engineering from a young age. 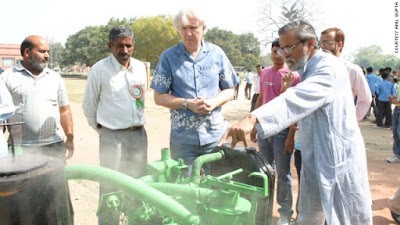 The gassifier -- developed over 20 years -- creates fuel from farm waste bringing power to otherwise isolated areas of the country to light houses, filter water, and run mills. 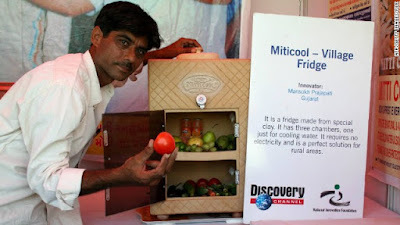 The Mitticool Fridge was developed and launched by Indian engineer, Mansukhbhai Prajapati (pictured), in 2006. Made entirely from clay, the device costs roughly $50 and uses no electrical power. It can keep items of food fresh for up to five days and has been a valuable addition to rural communities in India. D. Renganathan developed a mechanical tree climber which can be used for scaling palm and coconut trees. 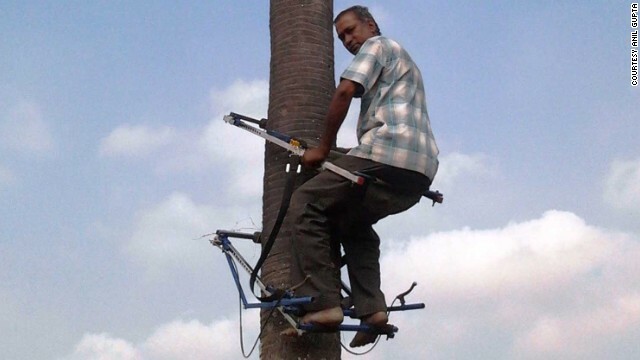 Climbing trees for harvest is difficult and dangerous work -- the tree climber designed by Renganathan uses a 'four-lock pin' system to prevent falls. The device now sells across south Asia. Remya, a high school girl from Kerala was forced to do laundry when her mother fell sick. 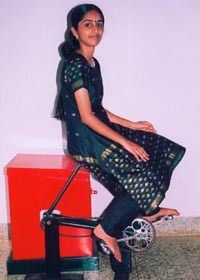 Out of her dislike to wash clothes by hand, Remya invented a pedal-powered washing machine at the age of 14. The machine, which looks like the exer-cycle which we see in a gymnasium, consists of an aluminium cabin containing a horizontal cylinder made of iron net. The cylinder is connected to a pedaling system that consists of a cycle chain, pedals and a seat. Clothes are put in the cylinder, the cabin is filled with water, detergent is added and is left to soak for some time. Pedal it for three to four minutes after that and you are done! The cylinder rotates at a very high speed with the clothes inside, cleaning them thoroughly. Soap water drains out, the barrel is refilled and the process repeated. By pedaling, the clothes also become about 80% dry. The Invention has many advantages. It doesn’t require electricity to work, it is hugely affordable and moreover, it replaces your exercise machine. Well, this beautiful invention from a village man- Dwarka Prasad Chaurasia of tremendous determination. His invention dates back to three decades. 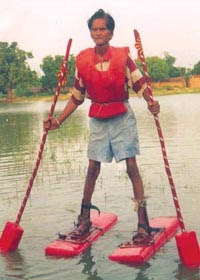 It is called the Water Walker, which comes handy in the flooded regions of India, even now. The shoes consist of two floats made of thermocol, bonded with a rexine sheet. This whole unit is attached to metal straps with back foot support. These two individual shoes are also tied to each other to prevent them from going apart beyond one's ability to steer them. The size of shoe gave him good buoyancy and ease in maneuvering. With a pair of hand held oars for balancing, a person can either walk or skate across the lake. Chaurasia had demonstrated his shoes in front of media at the Delhi Boat Club, which was widely covered. He was also interviewed by BBC at that time, which was great recognition for him. He had another invention on his name, “the amphibious cycle” which used the same principle of his shoes. 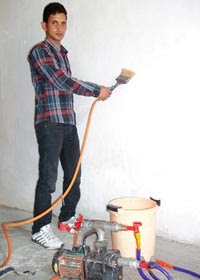 Jahangir Ahmad, a young student from the militancy hit Anantnag district of Jammu & Kashmir invented eclectic painting brush, which is essentially a blessing to the painting workers. His invention avoids the need for dipping brush into the paint bucket, which decrease the tediousness of the job and saves paint. Jahangir was the son of a carpenter. He used to work while studying in order to help his poor family and also fund himself. One day he saw some workers painting a high wall near his house. They were struggling with the work as there is little space on the ladder to keep the paint bucket. They have to periodically dip the brush in the bucket and manage everything without losing the grip from ladder. The paint was also spilled over the worker’s clothes. After seeing this, he was determined to reduce their effort. The automatic painting device he invented has a painting brush attached to a tube, which goes directly to a paint bucket via a motor which pumps the paint to brush. User can control flow of paint through a liver and the paint is equally distributed to bristles at 4 places through a distributor. His working prototype has great commercial potential along with wide usability. 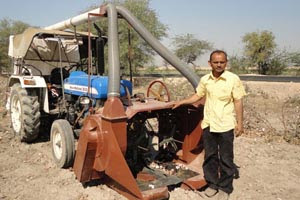 Nattubhai Vader, a farmer from Gujarat invented the cotton harvester, a machine which can be fitted to a tractor for harvesting the cotton. He was determined to make a machine for harvesting the troublesome variety of cotton, after he saw women and children performing the slow exhausting work in the fields. His determination paid off well as he designed and tweaked a massive apparatus of spinning rubber hoses and vacuums to fit over a tractor. The apparatus can pick as much cotton in one hour as 10 people can harvest in two days. In the villages, water is mainly drawn from wells. The traditionally designed pulley system is physically demanding, especially for the women folk. 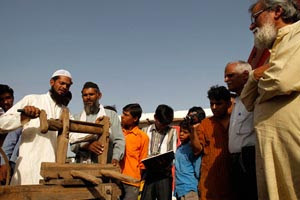 Realizing the importance of pulley in the daily routine of average rural women, Amit Agrawat has decided to redesign it. He came up with a pulley attached to a braking system or a “stopper.” He made three pulleys- Ganga, Yamuna and Saraswathi, which can be used according to the type of the well. The pulleys allow women to rest mid way through their labour. 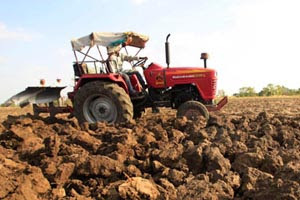 The village farmers of Madhya Pradesh were finding it difficult to work on the thick and hard soil in the fields with their tractors. It required them to put extra weight to the machine. The tractor salesmen were trying to sell them expensive weights to attach to vehicles. But the farmers invented an inexpensive and easy way by simply filling the tires with water, which gave an added weight at literally, no cost. They not only saved money, but also invented something which can be benefitted by millions of farmers across the country. Abdul Rahim Khan a farmer from the village of Mogra had many small inventions under his belt. Among that, his miniature cotton deeseeder is a miracle. It cost less than [​IMG] 220 to make and saved 10 times as much each year in processing fees. India’s best chances to make its mark on innovation may be in cleantech and other disruptive technologies that can improve the quality of life for the world’s poor while enriching their inventors and investors. Such inventions along that vein, a low-cost, durable, prosthesis known as the Jaipur foot, has restored function to amputees the world over and is probably the best-known Indian innovation to have found a global market.